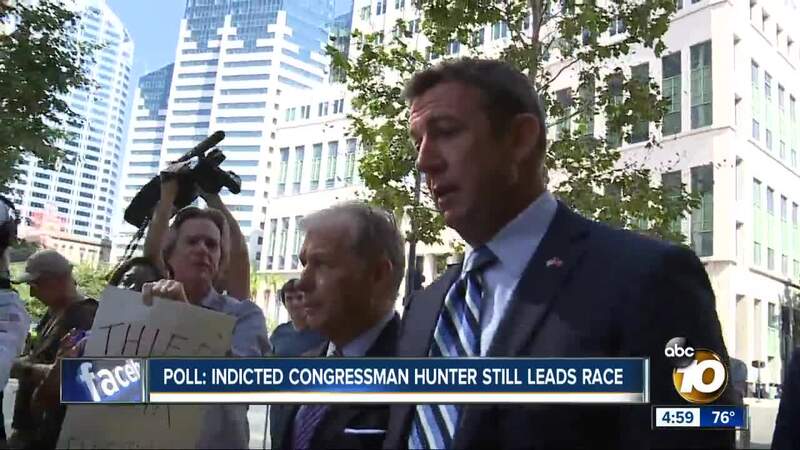 SAN DIEGO (KGTV) - A federal indictment is not having a detrimental effect on Rep. Duncan Hunter’s bid to keep his 50th Congressional District seat, according to a new survey. 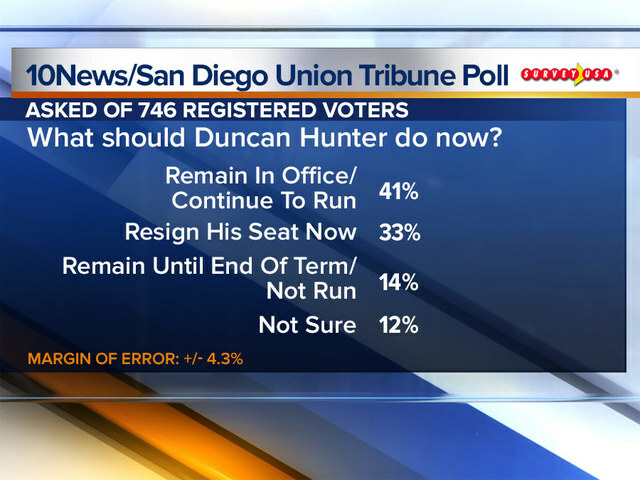 In a 10News/San Diego Union-Tribune poll conducted by SurveyUSA , 77 percent of likely Republican voters from the 50th District said they would still vote for Hunter if the election were held today. The poll also showed 64 percent of GOP voters believe the federal charges against the San Diego congressman are politically motivated. Meanwhile, 62 percent of Democrats from the 50th District said Hunter should resign from his seat now. Sixty-four percent of Republican voters said Hunter should stay in office. 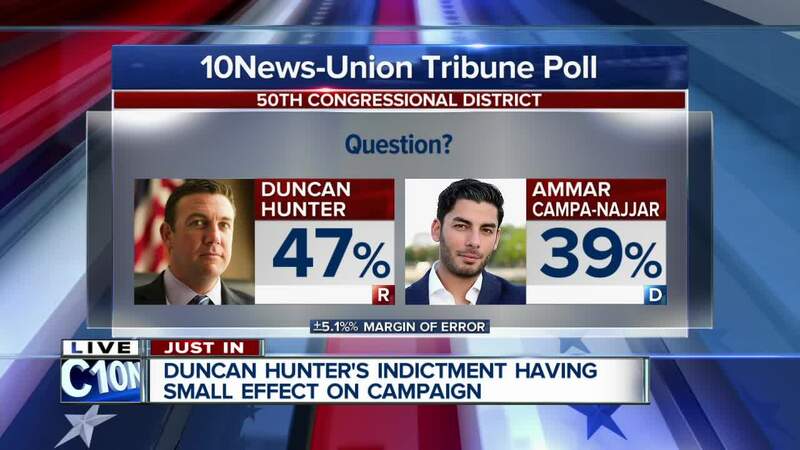 Prior to the federal indictment against Hunter and his wife Margaret for accusations of misusing campaign funds, the longtime congressman held a good-sized lead over Democratic opponent Ammar Campa-Najjar. 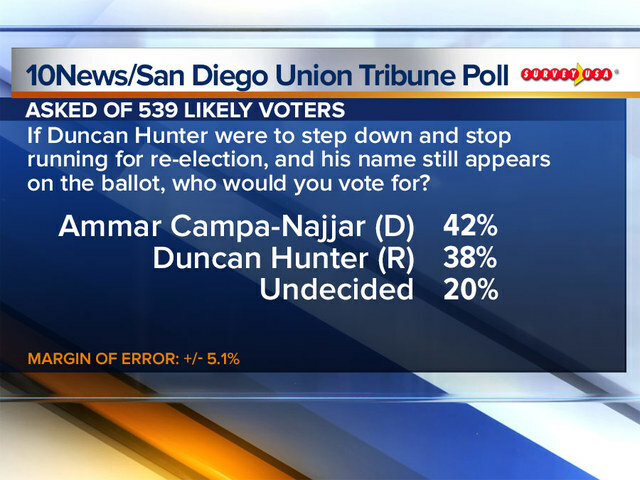 In a May poll , Hunter held a 43 percent to 10 percent lead over Campa-Najjar. Hunter defeated his challengers in the June primary election, paving the way for a November showdown with Campa-Najjar. In the latest poll, which was conducted days after the indictment was announced, Campa-Najjar has made the race close. He trails Hunter 47 percent to 39 percent, the poll showed. 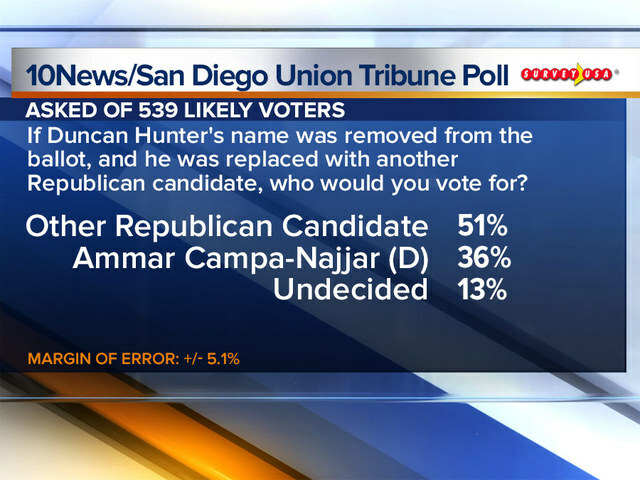 The poll also showed 42 percent of voters would elect Campa-Najjar if Hunter were to step down and end his reelection bid, but his name remained on the ballot. In the 50th Congressional District race, if the only candidates on the ballot were Duncan Hunter and Ammar Campa-Najjar, who would you vote for? 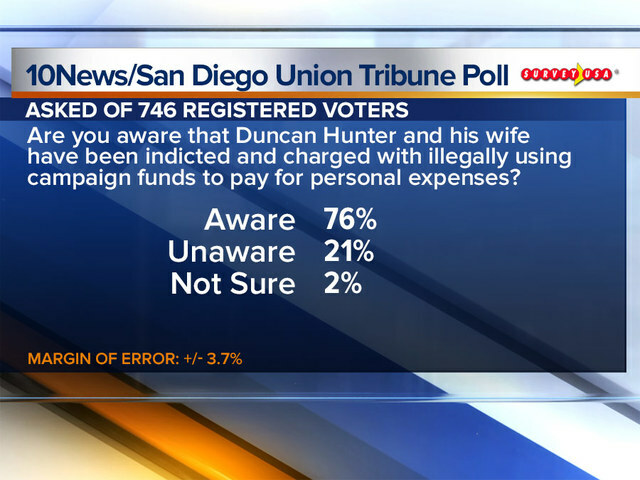 Are you aware that Duncan Hunter and his wife have been indicted and charged with illegally using campaign funds to pay for personal expenses? 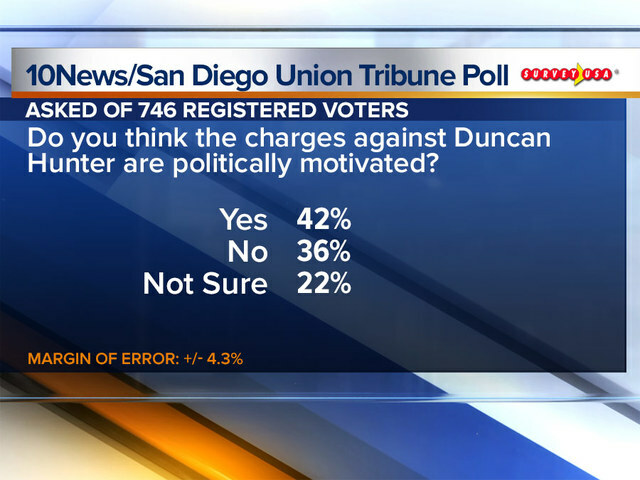 Do you think the charges against Duncan Hunter are politically motivated? What should Duncan Hunter do now? 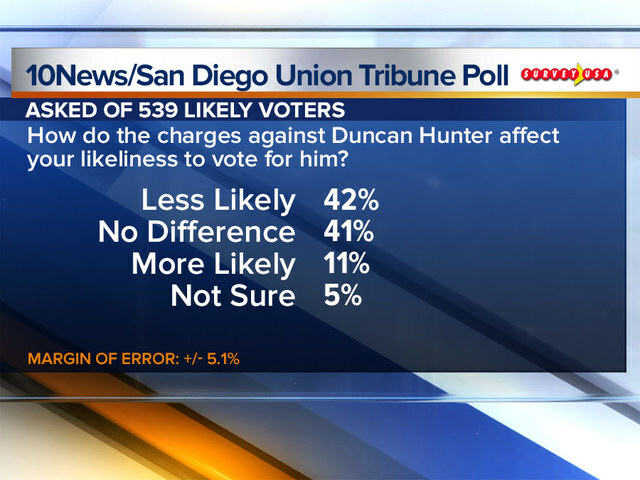 How do the charges against Duncan Hunter affect your likeliness to vote for him? If Duncan Hunter were to step down and stop running for re-election, and his name still appears on the ballot, who would you vote for? If Duncan Hunter's name was removed from the ballot, and he was replaced with another Republican candidate, who would you vote for?